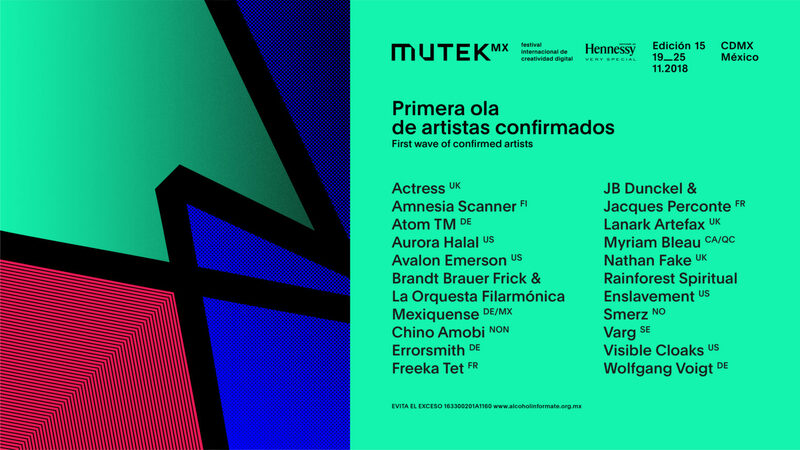 Mutek Mexico have announced the first wave of artists for its November festival including Avalon Emerson, Actress, Nathan Fake and Lanark Artefax. The Montreal-based Mutek organisation hosts its Mexico City festival, Mutek.MX from 19th to 25th November with Aurora Halal, Wolfgang Voigt, Visible Cloaks and Errorsmith also playing. Mutek Mexico moved to November last year due to the Mexico City earthquake in September after which festival staff assisted with relief efforts. In the festival organisers' own words, this year's event intends to “provide an opening on the more adventurous sides of electronic music and digital creativity”. “Building bridges between art and technology”, the event will also see Amnesia Scanner, Brandt Brauer Frick & La Orchestra Filarmonica Mexiquense, Rainforest Spiritual Enslavement, Chino Amobi, Freeka Tet, Smerz, Varg, Myriam Blue and JB Dunckel & Jacques Perconte performing. MUTEK were one of the festival organisations that signed up to the Keychange pledge on gender equality earlier this year, which aims to have a 50:50 gender balance of artists by 2022. Avalon Emerson can also be heard at Dimensions festival in Croatia at the end of the month, the full details and line-up for which can be discovered here. While early bird tickets have sold out, tickets for Mutek Mexico can be found on their website.